Do you want to know a secret [door]? I’ve got relatively reasonable ambitions when it comes to money. I’d like to earn enough, with an eventual partner, to support ourselves and our family in comfort, while still saving a large portion of our income for the future. But if I should happen to find myself fabulously wealthy for one reason or another, there’s one useless luxury I’d love to be able to dump money into: a secret-riddled home. 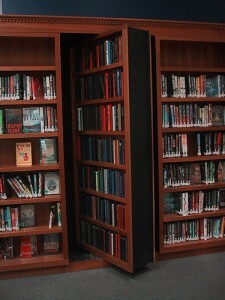 Maybe I read too many mystery novels as a kid, or (more likely) all the hours I spent playing the “Myst” series of computer have left me enthralled by the concept of secret passages, hidden doors and the like. But a bookshelf that swung open to reveal my private office when a particular volume was depressed would be the height of awesome, as a Wired.com feature today reminds me. Still, it’s nice to know there are people out there dedicated to making these ludicrous dreams a reality.